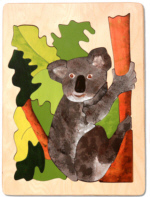 Our cute Koala puzzle is beautifully hand-colored. Another great gift for the puzzle loving man or woman in your life! 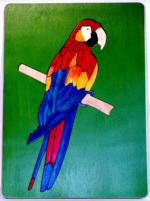 This beautifully hand colored macaw has only 43 pieces - BUT, TAKE NOTE - the pieces are colored on BOTH SIDES. Price includes artistic draw-string bag. 16" high x 12" wide x ½"
With a little help the first few times, your 3 to 6 year-old will be solving this endearing panda puzzle over and over. 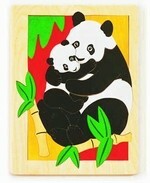 Warm red and gold colors compliment the black and white of the pandas. Because of the abstract shapes, this puzzle is more challenging than you’d guess. Challenge level is high on this one. Want it harder? Ask us to color both sides! 12" high x 12" wide x ½"
Anyone who loves whales will enjoy adding this Orca whale puzzle to their collection. One piece for the whale allows it to be used in story-board and imagination play.If you'd like us to make this puzzle with more pieces for an older whale-lover? Just ell us in the comments box at check-out. 12" high x 16" wide x ½"
Pretty enough to hang on the wall. A good challenge, due to all the white feather pieces.Want it even harder? Ask us to color both sides! 12” high x 12” wide x ½"
Cute as a bug!Start teaching for nature early. Finger holes add tactile interest to this crafted wooden puzzle. One of four "Botanical" puzzles, this beautiful hand-painted Monarch Butterfly puzzle will appeal to children and adults. See also our Ladybugs, Froggy, and (under the "crafts" tab), "Pond Scene". If you'd like this cut with extra pieces, just let us know! One of four "Botanical" puzzles, this happy frog sits on a lily pad enjoying the view of a beautiful flower. See also our Ladybugs, Monarch Butterfly, and (under the "crafts" tab), "Pond Scene". This happy parrot puzzle sports bright colors. 10” high by 10” wide x ½"
Preschool puzzle. A one-piece burly brown bear atop a textured rock takes a swipe at an almost invisible trout in this mountain scene. A traditional image of a mallard duck. 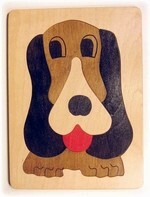 16” high x 12” wide x ½"
This friendly dog makes a good early learning puzzle: kids can relate to proper placement for eyes, nose, ears and tongue. This St. Bernard puzzle is cute for children age 3 to 6 who love dogs, or request it with extra pieces for you ski chalet! Dinosaur Preschool Puzzle 12" high x 12" wide x ½"
Fanciful tyrannosaurus, Apatosaurus, & hatchling cavort in front of a spouting volcano. Handpainted using all water-based, non-toxic colors. 12" high by 12" wide x½"
This prancing pony puzzle is a good challenge for kids 5 to 7 years old. A boy and girl hold a contented cat in this puzzle. Great for preschools and other places where children age 3 to 6 play. 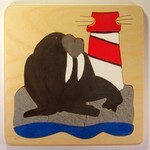 The beach in this puzzle is rough-textured, the walrus is one intact piece, as is the lighthouse. A good one for sight-impaired puzzlers. Crowned with 13 stars representing the first American states, this bald eagle puzzle is challenging. Suggested for ages 12 to adult. Want it harder? Ask us to color both sides!